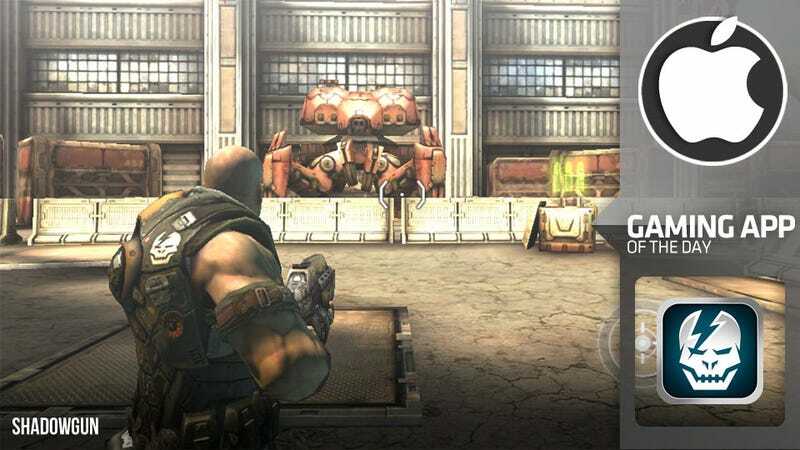 With console-quality graphics, witty dialog, and surprisingly satisfying cover-based shooting controls, Madfinger's Shadowgun is an amazing accomplishment of an iOS title, sadly cheapened by the developers obvious attempts to ape Epic's Gears of War. You can see it in the absurdly beefy protagonist, his armor emblazoned with a symbol only slightly removed from the COG logo. Skittering robots that charge the player and explode might as well be Tickers, the combustible insects bred by the Locust as weapons. Squint your eyes and the leather-wearing mutant humanoid could well be Locust themselves. Amidst these Gears trappings comes the galaxy's most infamous bounty hunter, John Slade. Slade's been tasked with hunting down Dr. Edgar Simon, a mad scientist that's sequestered himself in a mountain fortress, surrounded by mutants and maniacal machines of his own design. With the aid of his personal assistant android, S.A.R.A., Mr. Slade must move from cover-filled environment to cover-filled environment, ducking behind things while shooting at other things. S.A.R.A. may only be a voice in Slade's communicator, but she provides the important service of giving Slade someone to talk to in-between fights. The dialog is witty in an action movie sort of way, with Slade and S.A.R.A. 's back-and-forth bringing to mind Halo's Master Chief and Cortana at their best. The ducking and shooting is actually handled quite well. Moving the virtual joystick with the left thumb towards cover plants Slade against it. Moving it back pulls him out of cover, where he'll quickly be shot and killed. You don't want to spend too much time out of cover. The right thumb controls shooting, reloading, and weapon swapping. It's all very fast and responsive, easily one of the best sets of shooter controls I've encountered in a mobile game. When you aren't ducking and covering or unlocking doors with key cards, Shadowgun does manage to inject a little variety into the standard shooter formula. There's a Simon-esque hacking mini-game that pops up now and again, and some of the boss fights are quite unique. I particularly enjoyed the gigantic drilling machine that had me running through a tunnel, urgently shooting behind me to activate weapons to slow the marauding machine down. It was a fresh and completely unexpected encounter. And then there's Cyberlobster. You just can't go wrong with a boss called Cyberlobster. And of course there's those gorgeous graphics. Easily on par with downloadable console titles, these are the sort of visuals that make mobile game reviewers reference Epic's Infinity Blade, the current iOS graphics showpiece. An amazing game that's well worth the $7.99 asking price, the only real downside to Shadowgun is that by positioning itself as the Gears of War for the iPhone it comes off feeling like a light version of a game from that franchise, rather than the spectacular mobile gaming achievement it really is.